There are about 4 of the long leading indicators that are fluctuating near the levels where their rating of positive/neutral/negative changes. To see the direction they fluctuated in, click on over and put a penny or two in my pocket in the process. Is the rental vacancy rate a leading signal for the housing market? Here is something I noticed while putting together my piece yesterday on the housing market. which, according to the graph, peaked in the 3rd Quarter of last year, and has declined since. It occurred to me that this is probably not a coincidence. If housing unaffordability has become a real constraint for potential buyers, then there should be an increasing number of such buyers who are forced to rent instead -- which would drive down the rental vacancy rate. It also looks like the rental vacancy rate peaked in 1997-98 and early 2004, in advance of the last two cyclical housing peaks, which I suspect is also not a coincidence. 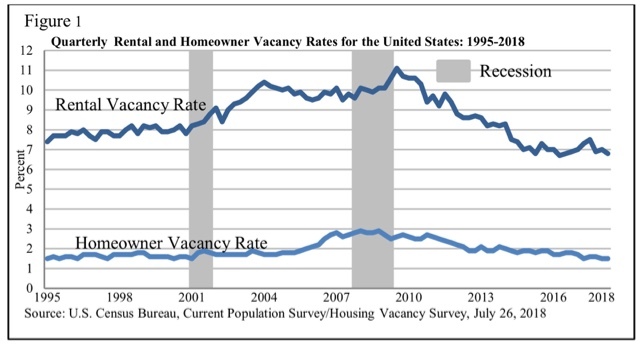 So, is there a leading signal for the housing market in the rental vacancy rate? My preliminary perusal makes me think it's complicated. I'm chewing it over. That's enough for both series to be scored as negatives, although the new home sales downturn could easily be revised away, and existing home sales are the least important of all housing indicators. 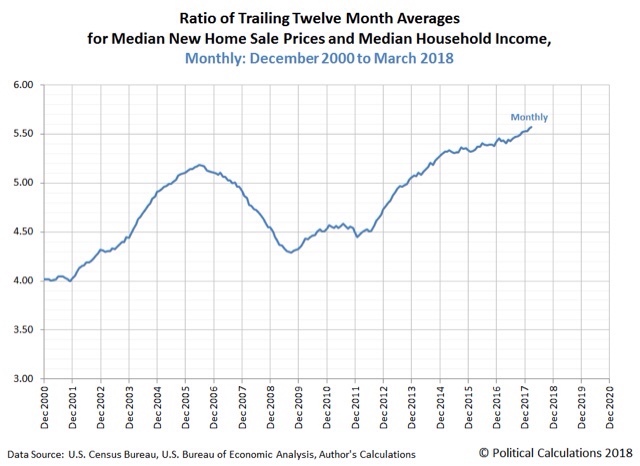 I'll have a full analysis of all home sales indicators up at Seeking Alpha, and when it comes online, I will link to it. UPDATE: and here's the link! Pew Charitable Trust confirms the "rental (and ownership) affordability crisis"
.... The steadily rising demand for rental properties over the past decade has reduced vacancy rates to near historic lows, fueling a rapid increase in rental market prices that has outpaced household incomes for many families. This imbalance is contributing to high rates of “rent burden” .... In 2015, 38 percent of all “renter households” were rent burdened, an increase of about 19 percent from 2001. ....[A] 2016 Pew Research Center survey found that 72 percent of renters said they want to buy a home at some point, and most cited financial reasons when asked why they rent. Another recent public opinion poll asked renters ages 18-34 why they were not buying homes, and 57 percent said they could not obtain a mortgage. On the other hand, a recent survey of Americans over 55 found that 71 percent of those who plan to move again said they intended to rent rather than buy. Most renters over 55 cited cost as a driver of their decision and said it makes the most sense for people their age to rent. the increased demand for rental properties and their limited supply, along with the lingering effects of foreclosures, demographic changes, and a decline in the rate of renters transitioning to owning, have led to higher rents. 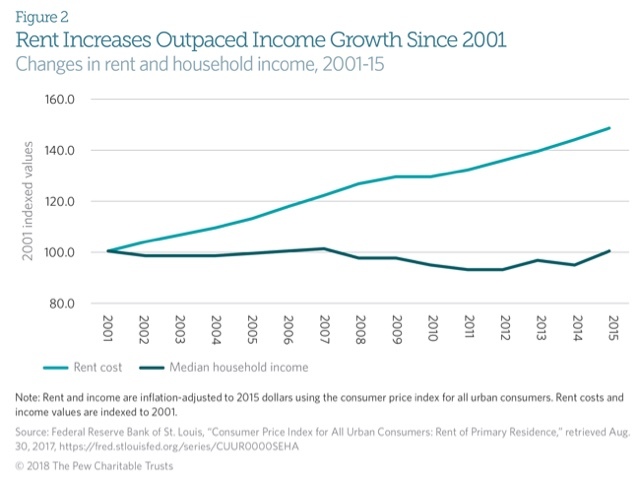 Between 2001 and 2015, the median rent rose from $512 a month to $678, a 32 percent increase. This is nearly an identical graph to the one I have posted several times, except that it uses the CPI for rents as opposed to the American Community Survey's "median asking rent" metric, in comparison with median household income. .... In 2015, nearly 43 million American households lived in rental housing, an increase of 9.3 million since 2004 and the largest rise since 1970.... However, unlike the early 1970s when young families drove the increase in renting, the 2015 spike is largely propelled by those 55 and older, largely baby boomers, who are responsible for a 4.3 million jump in the number of renters since 2005. It seems that Boomers haven't quite finished being "the bulge in the belly of the python" as they compete with the equally large Millennial generation for the scarce resource of apartment housing. The bottom line here is that incomes simply have not kept up with the costs of all sorts of housing, for both owners and renters. The best way to resolve this problem would be for much more multi-unit housing to be built. Why it isn't being built is something I have not seen authoritatively addressed. Some, like Matt Yglesias, think it's all about zoning. There is also the issue of whether building costs are too high for units aimed at lower income dwellers. Part of the issue may also be an increasing oligopolies of local builders. Whatever the cause may be, it is a real problem, and interest rate hikes by the Fed, which make mortgages more expensive, are severely counter-productive. How well do weekly purchase mortgage applications forecast monthly housing permits and sales? Tomorrow purchase mortgage applications will get their regular weekly update. Their 4 week average went negative YoY last week, for the first time in over three years, after having made a new post-recession high only two months ago. Of course, I have no idea if this declining trend will continue or not. 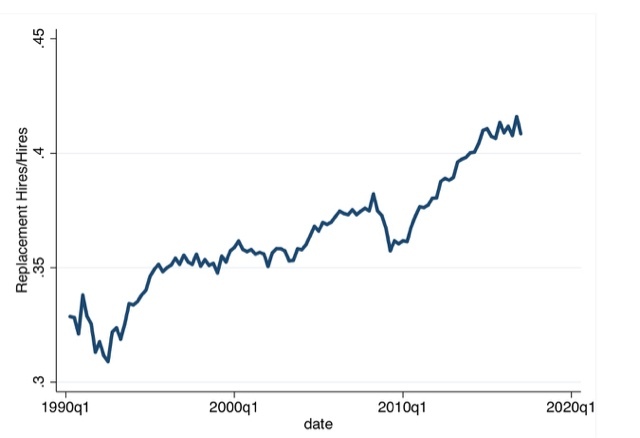 But if it does persist, how reliable a portent is that for the housing market as a whole? Both measures of permits appear to have made equivalent troughs and the overall peak between 1 -3 months later. The Mortgage Bankers Association put down their problem during the housing bust to compositional issues, i.e., not adequately picking up newer, non-bank issuers. 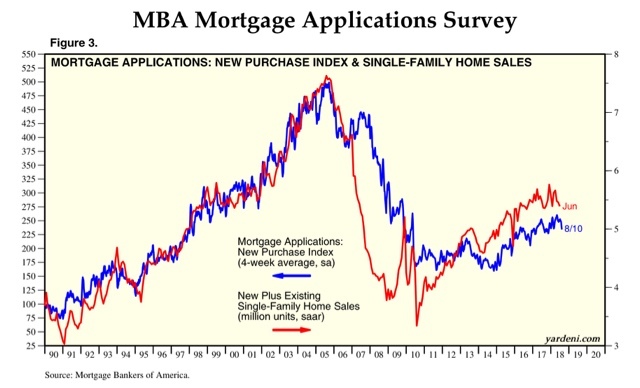 Indeed, since 2013, mortgage applications have coincided very well with new+existing home sales, increasing in 2013 with low rates and then decreasing in 2014 in response to the "taper tantrum." Last year - 2017 - both mortgage applications and permits had a downturn during the summer that resolved positively in autumn. 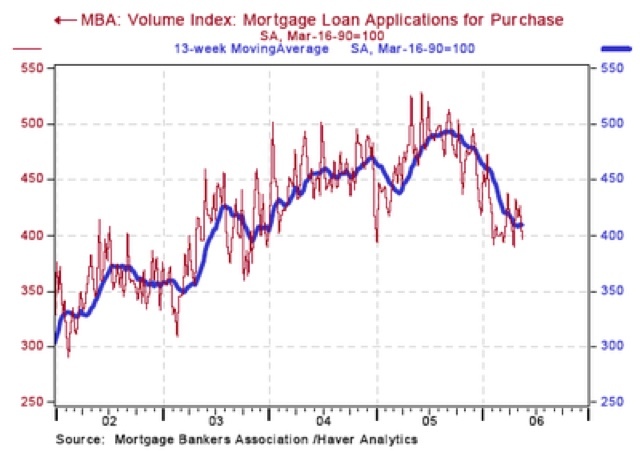 So if the MBA is correct, then if the current downdraft in applications continues, it should be mirrored in the monthly reports on permits and home sales within the next several months. Because "new home sales" are *very* volatile and *heavily* revised, I can't give any kind of specific forecast for this week's report, but in the spirit of making some sort of testable prediction, the argument here suggests that most likely the report will be higher YoY (above 558,000), but below the best levels of earlier this year (672,000). Every month when the JOLTS report comes out, I rail against "job openings" as some sort of hard data, and in particular the notion that the US is at "full employment" because the number of "openings" exceeds the number of "unemployed" in the monthly jobs report. "Job openings" may be firms holding out for the candidate who will accept the job at the rate they want to pay, and/or keeping the listing open just to troll for resumes. Well, it turns out it's worse than that. build[ ] a model where firms post long-lived vacancies and engage in on-the-job search for more productive workers. These features improve a firm's bargaining position while raising workers' job insecurity and the wedge between hiring and meeting rates. All three channels lower wages while raising productivity.... The socially efficient outcome features fewer low-productivity jobs and a 10 percent narrower productivity-wage gap. What is a "replacement hire"? It's a hire that is not for a new position (per the Census Bureau), or in other words, to replace a currently occupied position. It could be in anticipation of worker(s) quitting, or it can also be trolling for "better" workers, in which existing workers will be fired. In fact, "replacement hiring" has exceeded 1990s levels during the entirety of this expansion, all the way back to 2009 when there was over 10% unemployment! Further, it is clear that companies are using "replacement hiring" as a means to decrease wage demands from their current workforce. 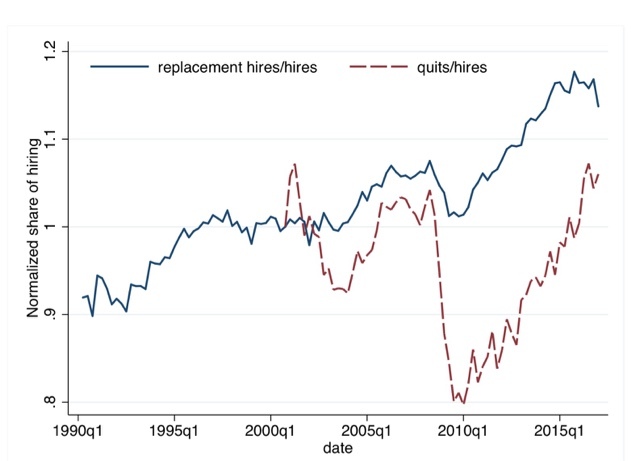 Acharya and Wee calculated the ratio of "voluntary quits" to "hires" from the JOLTS data, and compared that with the above graph on "replacement hiring:"
[A] larger replacement hiring share, the higher market power of firms, larger job insecurity faced by workers, and lower measured matching efficiency in the labor market allow firms to reap productivity gains from replacing workers while still keeping wages low. Compared to the efficient benchmark, private agents in the decentralized economy do not internalize the rat race externality and tend to create too many low productivity jobs. This in turn raises the incidence of replacement hiring and widens the gap between productivity and wages. In plain english, companies who are constantly holding the threat over current employees' heads that the firm has an ongoing quest to replace them, are companies whose workers don't demand increased wages. As an aside, note that the graphs measure opinions per group, and definitely *not* their number. Also, it's hardly a complete snapshot of voters, since it doesn't include all the others who voted for Trump. More on that below. But I wanted to make a couple of comments. First of all, the Obama voters who then voted for Clinton, a third party candidate, or just stayed home all had a pretty similar worldview with the exception of Obamacare. The disaffected voters who abandoned Clinton almost certainly did so because of their views of the candidate, not their views of the issues. For them, Clinton was a warmonger, or a corporate shill, or a crook (because didn't Comey almost directly say so? ), or had some other personal shortcoming. 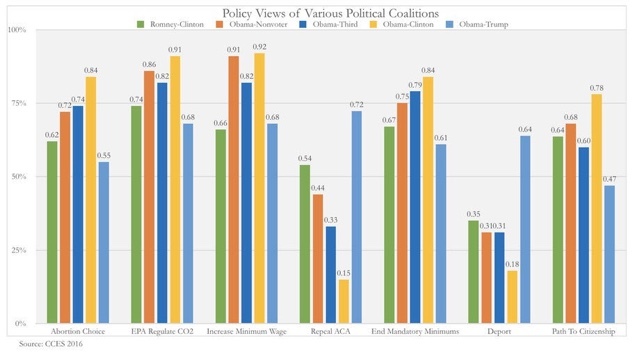 By contrast, the Romney-Clinton voters were closer to the Obama-Trump voters than to the Obama-Clinton voters on everything except for xenophobia (the two issues furthest to the right on the graph). In short, Romney-Clinton voters were garden variety GOPers who simply could not stomach Trump personally -- i.e., the "never Trump-ers." If Trump is the GOP nominee in 2020, at least some of them will refuse to vote for him again. Here's where it's a shame that the bar graphs don't include Romney-Trump voters. Because it would be nice to compare them with Obama-Trump voters. My sense is that Obama-Trump voters had a strong positive reaction to Trump's populism while either not being offended by, or at least not taking seriously, Trump's xenophobia and racism. The former Obama-Trump voters are the ideological descendants of the old Dixiecrats: nativist-populists who believe in government programs, so long as those programs benefit *them,* and not ethnic or racial "others." They probably only voted for Obama because the economy was so bad in 2008, and had improved (just barely enough) in 2012. Here's the bottom line I see: if in 2020 the Democrats nominate a reasonably "safe" candidate, the Obama-third party and Obama-nonvoter voters are probably coming back. Depending on the state of the economy, so are some of those who didn't take Trump's racism seriously. (Yes, his racism wasn't a dealbreaker, but imo this group are reachable with reason). Unless the economy in 2020 is as bad as it was in late 2008, the Dixiecrats are gone, and I see no reason to try to accommodate them.